According to archeological findings, Chinese dance has a history of over five thousand years. Until the Han dynasty (206 B. C. - A. D. 220), most of the Chinese dances were originated from the folks. During the Han period, a musical entertainment court was established for the imperial family, which was essentially a center for systematically documenting and enhancing folk songs and dances. Because of the political stability and the economic prosperity of the Tang dynasty (A. D. 618 - 907), poetry, music and dance were given opportunities to flourish. The Tang dynasty has been regarded as the golden age for dance in ancient China. Dances in the Tang dynasty inherited techniques that were developed in the past dynasties such as Zhou, Qin, Han, Wei, Jin, and Nanbei. During the early Tang period, Buddhism was introduced to China and because trade and social relationship with other countries rapidly expanded, dances was influenced by folk dances of other countries such as India, Rome, Persia (Iran), Korea, Cambodia, Burma, Vietnam, and other Central Asian countries. In addition, it also combined with other forms of fine arts such as painting, scenery, and colorful costumes as well as poetry, classical music and drama. The combination of these colorful traditions brought the performing arts to a new peak of entertainment. The emperors of the Tang dynasty, in general, paid significant attention to the development of the Chinese dance and music. Several of them directly contributed to this effort. Among them, Emperor Li Shimin personally composed a song Pozhenyuetu, which was successfully staged for a major dance festival. The choreography of Pozhenyuetu was further enhanced by Emperor Li Lonji (also known as Tang Minhuang) and was later introduced to India, Tulufan (currently known as Xin-Jiang) and Japan. The Tang dynasty also had another brilliant piece of music Nishangyuyi, which was composed by the Tang Minhuang who was talented in music and dance. Tang Minhuang used graceful traditional dance techniques combining with marvelous Indian dance skills and music to portray an elegant fairyland with beautiful maidens. Staged by Tang Minhuang, danced by his famous concubine and dancer Yang Guifei, and music played by Liyuan, the Nishangyuyi dance has been regarded as one of the splendid treasures in China's dance history. 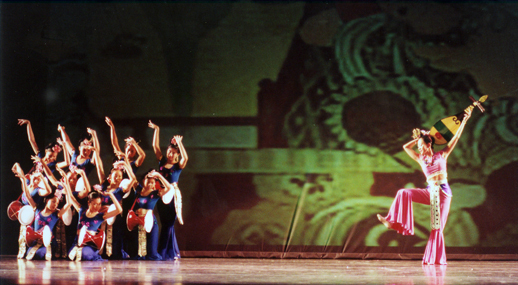 The magnificent dance of the Tang period was the result of inheriting the traditions, enhancing the Chinese classical and folk dance techniques, as well as widely incorporating music and dance skills from other countries. 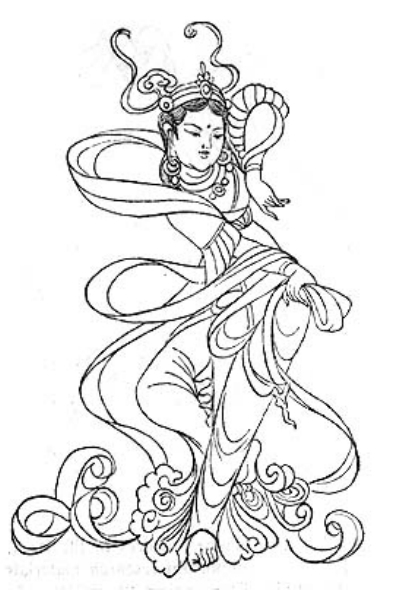 Due to the broad spectrum of styles, characteristics and topics, dance was one of the favorite performing arts and was very well received by almost every social class during the Tang period. It also played a significant role in the social relationship among different countries as well as different ethnic groups. The Chinese classical dance has passed from generation to generation, and is still practiced by the Chinese classical and folk dance community. The above article was written in Chinese by Jean Yu and translated by Kokmeng Lee (May 2, 1999). Dunhuang Pipa and Drum, performed as a part of the program Ming, Gu, Xian at the Performing Arts Center at Gwinnett Center, September 11-12, 2004.